With the first day of Fall just days behind us, I started to get excited about all the new wardrobe staples necessary for chic fall outfits. My favorite time of year in Santa Cruz is Indian Summer, which we are definitely currently experiencing, but I know that the days of bright chilly mornings and warm cider are just around the corner. 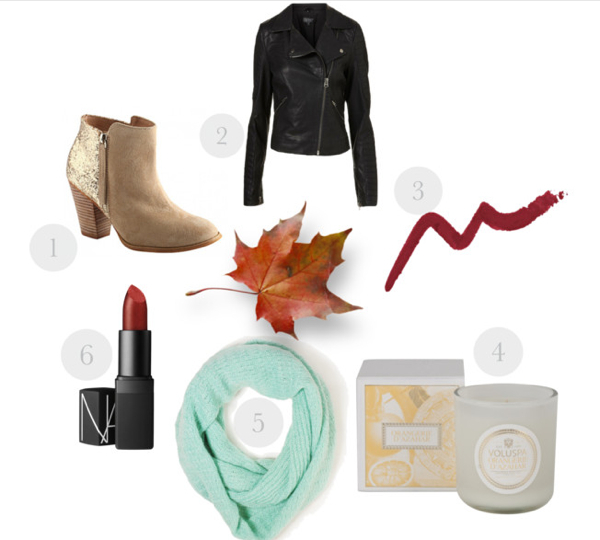 I made a Fall must-have list for myself, which I’ve already started to cross off. Here are a few of the things I’ve found necessary to make your closet ready for Fall and colder weather. 1. Cute ankle boots—these are a great way to spice up skinny jeans and are much more comfortable than heels. I love these sparkly Aldo ankle boots. 2. A leather jacket—I love the leather jacket trend because it’s both warm and chic for Fall. 3. Maroon—anything in this deep red wine color is on trend this season. 4. A yummy candle—nothing like a Voluspa candle to warm up a Fall evening. 5. Wrap scarf—I absolutely love scarves, and live in them in cooler weather. I think infinity scarves are the chicest and the warmest. 6. A great lip color—while you may be bringing darker colors into your closet for Fall, don’t forget to keep some color around. A nice red or pink lip is a great way to keep your look colorful.